Boxtops can be found on a large variety of groceries and PTO gets 10 cents for every one turned in, which can really add up. Each school is eligible to earn up to $20,000 per year!! Our coordinator submits the box tops in November and March, but they can be turned in any time during the school year. It helps if you can bag them in groups of 50. Watch for classroom contests during the year. 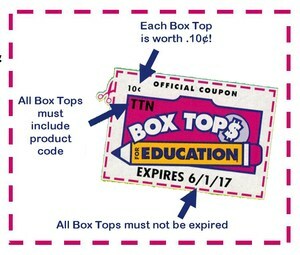 Do You Turn In Your Box Tops? Copyright © 2008-2019 Langston Hughes PTO All rights reserved.